Mrs. Yollis and her students could not have been any happier today! Bianca, from 2KM, and her wonderful mother, put together another Australian care package for the class. it's good for the heart, too! Today during Fun Thursday, students built a home for the koalas! Today was the health challenge jog-a-thon! The grass was being reseeded, so the new location was the lower yard. It was a fun location. There was little oval track, an obstacle course, hoola hooping, and so much more! Here is a fun video from the day! What was your favorite part about the Jog-a-thon? 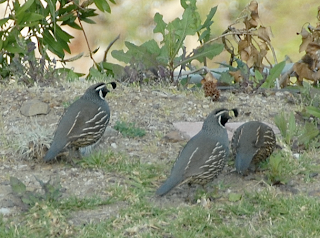 Who Wants to See a California Quail? 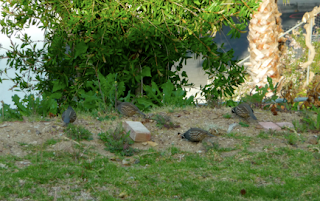 Over the weekend, Mrs. Yollis had some unexpected backyard visitors. The state bird of California dropped by! One male perched on top of the fountain while the others scratched around for food. They were difficult to spot because they blended in with their surroundings. There were four birds on the ground. Their beautiful plumage and crest are visible in this photo Mr. Yollis took! Here is a link to the Cornell Lab of Ornithology: All About Birds! (Ornithology is a fancy word for the scientific study of birds. Mr. and Mrs. Yollis have never seen the state bird in the wild. 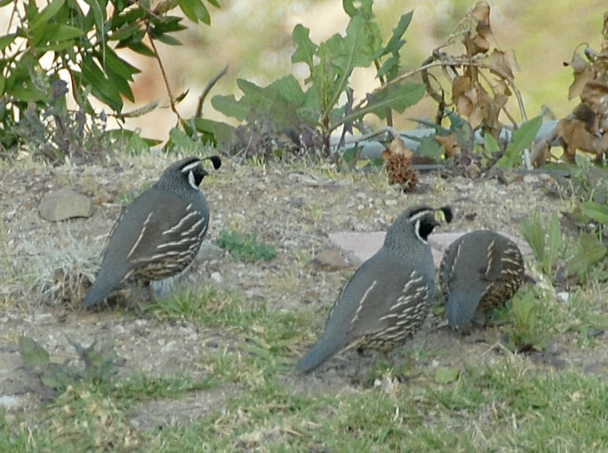 Do you know any fun facts about the California quail? The Smarties left a comment telling us about Western Australia's state bird, the black swan. Please share, what is your state bird? This is a call and response song. Please echo back to Mr. B.! Do you like Chay Chay Koo-lay? Did you sing with us? 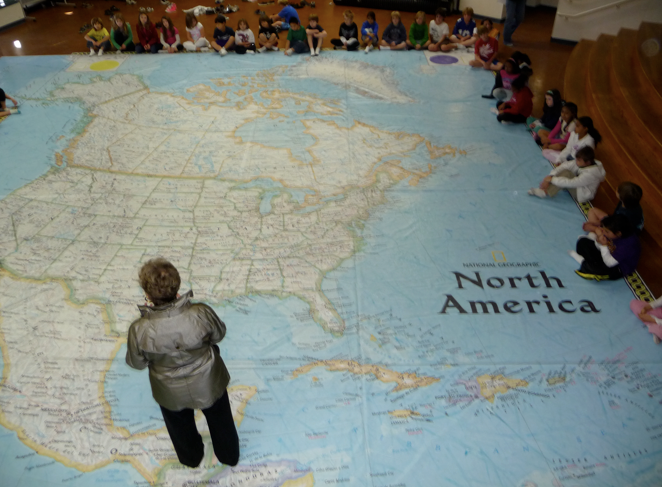 Video: Mrs. Yollis' Class Visits North America! National Geographic has a wonderful educational program called the Giant Traveling Maps. 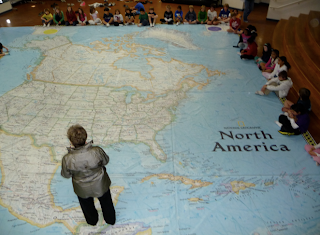 Ingrid Hanzer, a member of National Geographic's Grosvenor Council, sponsored the map for the school. 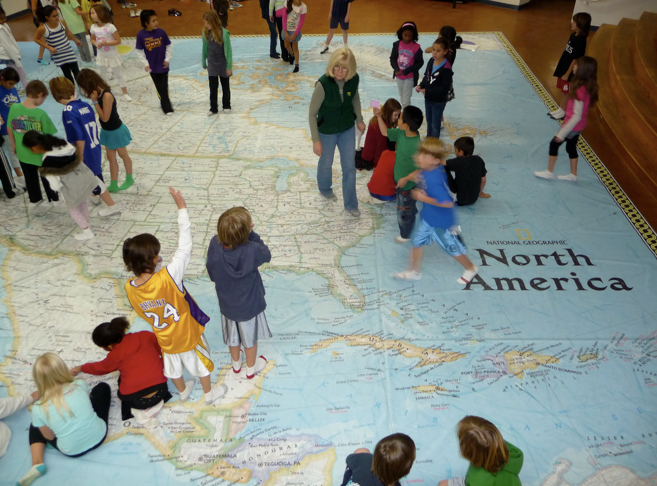 She spoke to Mrs. Yollis' class about the importance of learning about geography. 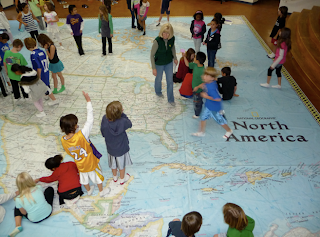 The students had opportunities to explore the giant map of North America. They used cones to create mountain ranges and blue plastic chains to trace the path of important rivers. 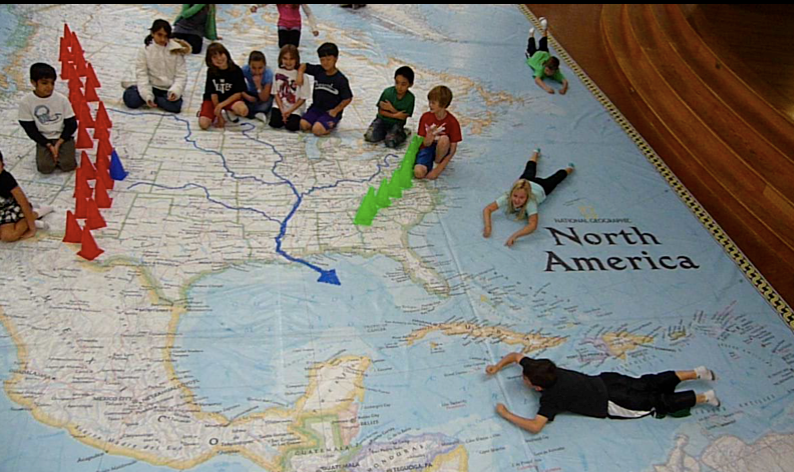 They visited the map several times and were able to film their experiences! Last year, Mrs. Yollis visited Asia! What do you think of North America? help explain the Vernal Equinox! 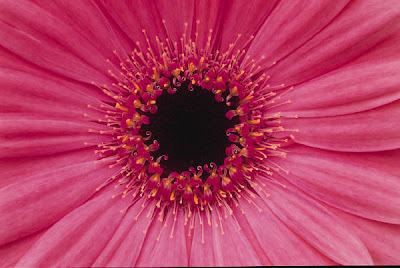 Even Mrs. Yollis' website is blooming! 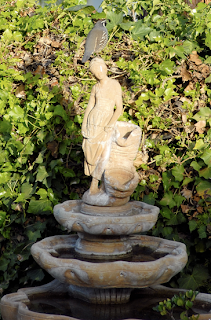 Do you have springtime hobbies or activities? 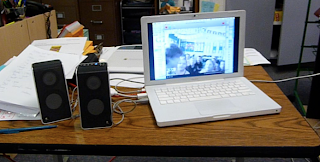 Skyping With Our Friends Down Under! 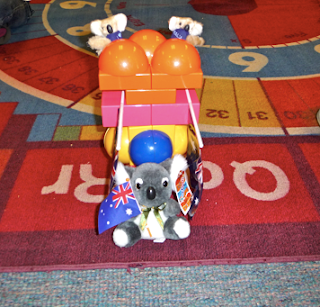 Last week, Mrs. Yollis' class received a surprise gift from their blogging buddies in Australia. A Skype call was planned for the following week. Unfortunately, with the daylight saving time change...Mrs. Yollis' class was out of school before 2KM started. 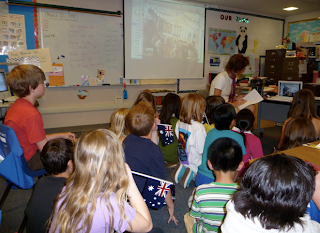 Some might have thought that the call would never happen...but so many students in Mrs. Yollis' class wanted to talk with their Australian friends... they stayed after school! 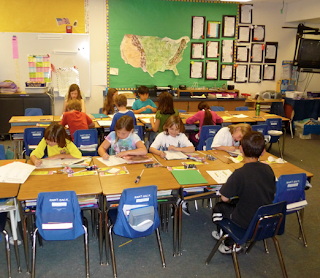 Here are a few of the students who stayed to complete their homework. Look at them go! Others came back for the call at 3:00 P.M. Right on time, Miss McGeady and 2KM called and the fun started! Everyone from 2KM got a chance to introduce themselves and tell us about a hobby they enjoyed! Some 2KM students like to play netball, soccer, or swim. Others like to dance or create art. A couple students have motorbikes. One girl likes to ride horses and another showed us some Karate moves! 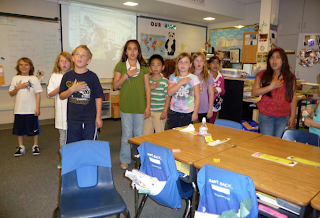 American students wondered if their Australian friends said a national pledge daily. They do not. 2KM asked if they could hear the American pledge. 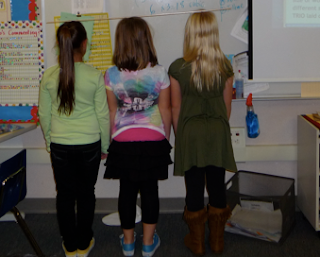 Each student from Mrs. Yollis' class stood up, faced the flag, and recited the pledge. We value our international friends and loved spending time with them today! What did you think of the Skype call? A Gift from our Friends Down Under! 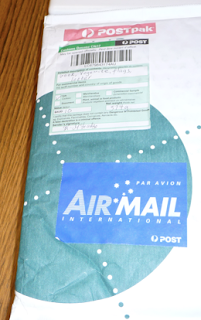 When Mrs. Yollis went to the office yesterday, there was a surprise Air-Mail package from Australia! Inside was a manifold of gifts from our good friends and fellow collaborators, Miss McGeady and 2KM! Inside was a wonderful letter from Miss McGready! 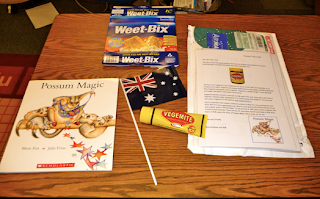 In addition, she included a famous Australian book by Mem Fox called Possom Magic complete with lesson plans. 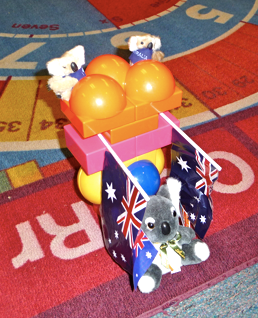 Also included was a carton of Weet-Bix, a tube of vegemite, and Australian flags for EVERYONE! We thank our Australian friends! We thank Miss McGeady and 2KM for their generosity and friendship! 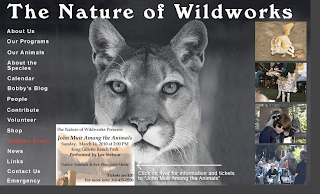 Today Mollie Hogan from The Nature of Wildworks visited our school with her rescued friends. Here is a link to Bobby the Bobcat's Blog! Which animal did you like the best? What facts can you add in the comment section? 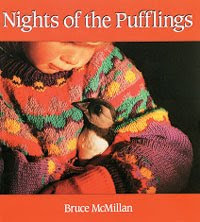 We read Nights of the Pufflings. It was about some children in Iceland who rescue pufflings. 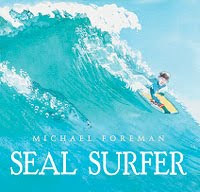 Another story called, Seal Surfer, was about a boy and his grandfather who befriend a mother seal and her pup. 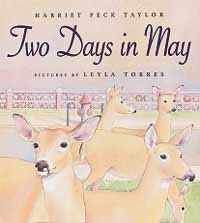 Our final story, Two Days in May, is about an urban community that must solve a wildlife problem. to research information about animals. Which animal story did you like the best and why? Leave us a comment with facts you've learned about an animal! 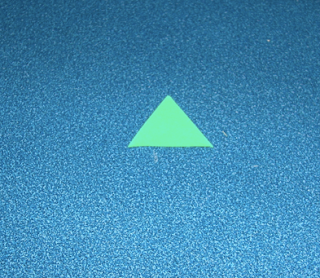 A polygon with three sides is called a triangle. We learned there are five kinds of triangles. The first one is an equilateral triangle. It has 3 equal sides and 3 equal angles. When you rotate an equilateral triangle, it looks the same. Secondly, is the isosceles triangle. 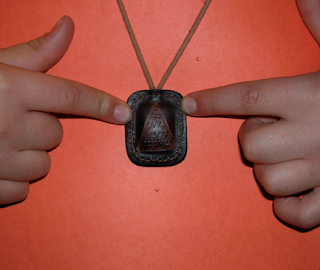 Gal was surprised to know that her necklace had an isosceles triangle on it! The isosceles triangle has 2 equal sides and 2 equal angles. Thirdly, is the isosceles right. An isosceles right has 2 equal sides and 2 equal angles. 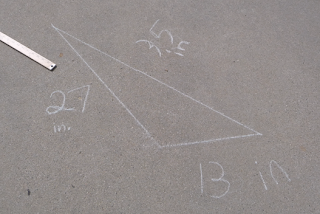 However, it has 1 right angle. It has no equal sides or angles. In addition, there is the scalene right. The scalene right has no equal sides, but it has 1 right angle. These are the five different triangles. Ms. Palmer, Jaxon's mom, wanted to know what kind of a triangle the trio would make. 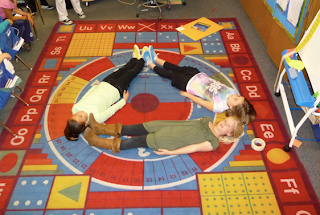 Here is the human isosceles triangle! 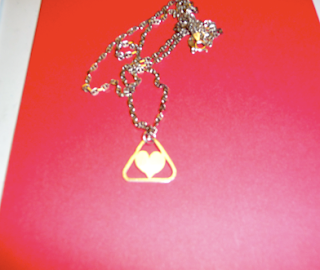 Also, here is the equilateral necklace Mrs. Yollis' husband made for her! What is your favorite triangle and why? 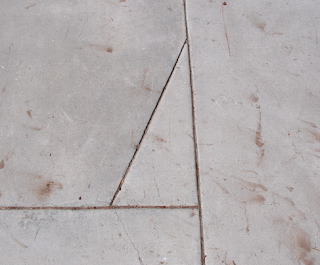 Are there any triangles at your school or house? We've Joined an International Blogging Challenge! of challenges to help them become better bloggers. 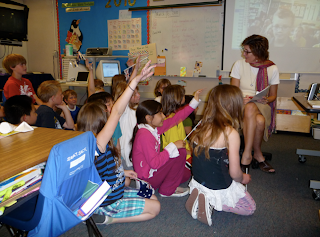 On your class blog, write a post about why students and classes should visit your blog. What will they learn from reading your posts? Are there any skills your class has that they could pass on to other classes and students? 1. Our blog offers useful tutorials! What are Quadrilaterals? 2. We know that plagiarism is WRONG! What is Plagiarism? 3. We have interesting travel posts! Visit China! Visit the Arctic Circle! Visit the Pacific Ocean! Visit Asia! 4. Maybe you like to sing. We offer sing-a-longs! The Hello Song! Hopefully we offer something of interest for you! Please leave us a comment and let us know where you are from! March 3 is World Maths Day! Click here to sign in and play! 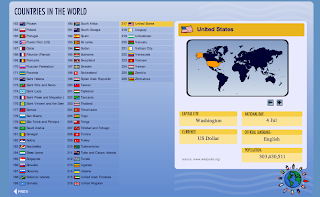 Click on country details at the bottom of the website to learn about other countries! How many correct answers are there? Which countries did you play against? Please leave a comment and share your experience!